Your average hospice chaplain. Probably had 3 units of Level II CPE. Recently I had a family whose mother was on hospice with us. When Isabel* had a sudden decline and became active her family gathered around the bedside and all started to say the things that families and caregivers – including hospice staff – feel that they need to say in order for the dying person to “let go”. They all said that they loved her and that they would be OK. They had out of town family come in and say good-bye in person and on the phone. They told her over and over again that it was OK for her to go. The priest gave last rites. This went on for well over a week. 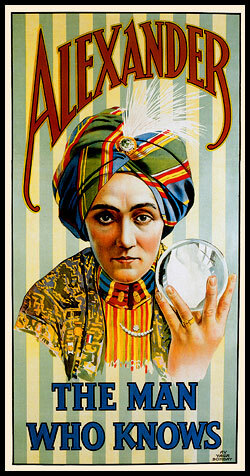 Magical thinking is the idea that things that are not necessarily causally related somehow are because our own attribution of will or meaning to them: “the belief that one’s thoughts by themselves can bring about effects in the world or that thinking something corresponds with doing it.” It’s the basis of many superstitions and, at its worst, obsessive compulsive disorder. There’s quite a bit of magical thinking that accompany illness, death and dying at times. A lot of it comes out in the grief process as bargaining or denial. This thinking is actually helpful in that it serves as a buffer for those processing traumatic, life-changing information. It’s also a way to consider options and think them through, even if they seem counterintuitive, impossible or counterproductive. I bring up magical thinking here because I see that going on in the “why is she still here?” question described previously. Often that question is related to trying to find meaning in the situation. At other times though it reflects the idea that when someone is dying, when we say the “magic words” (like “it’s OK”) or do the right things that only then will the person die. In the same way that some believe that if we aren’t ready to die that death will somehow be held at bay, it is believed that if we are “ready” that death will swoop down and carry us off. Death becomes a matter of personal will, and in the same way that I can will myself to live if I wish, I can also will myself to die. Families and caregivers may feel that if a person is “lingering” it’s due to the dying person’s will – they want to be alive for some reason, and we must find out what it is and help resolve it so that their will changes and they will then – immediately – die in peace. This is magical thinking. The truth of the matter is, I think, that we don’t have as much control of the dying process as we think we do. Dying is at it’s core a bodily process. Even if I am ready to die and others are ready for me to die, my body might not be. It is true that there are things that we need to say or do that will help the dying person be at peace and that this will ease any mental or spiritual anguish that is extending the dying process. However we need to recognize that as much as we need to say or do those things, that the person may not die the way we expect them to. Part of this is, frankly, pushed by us in the hospice and medical field. It’s pushed because so many of us have had experiences where the son finally came in, the priest arrived, or the family said “it’s OK” and then shortly thereafter the person died peacefully. However we should not assume or encourage others to assume that those examples generalize universally. The chaplain, an aide, a few family members and I stood around the bed. The chaplain began to play music and the patient yelled out, “NO” several times. The patient continued to be in distress until we stopped the music and everyone left the room. She calmed down immediately. In hindsight we realized we had put pressure on her to die before she was ready. She died a few days later in the early hours of the morning with her favorite aide by her bedside. I agree wholeheartedly that we cannot and should not push our own agenda regarding what needs to be done in a particular situation with a particular family. We all bring our own expectations about what a “good death” looks like and can unconsciously push that on others, or judge others when their idea of a good death doesn’t match our own. But I would also argue that just as we shouldn’t assume an agenda on our own, we also shouldn’t assume an agenda on behalf of the dying person. We need to remember that dying is a physical process as well as a spiritual and emotional one. These are all tied together of course, but we cannot discount the physical sphere in relation to the others. A person’s body still has the final word, I believe, regarding when it will die. It can be helpful to see and reflect on this as chaplains with our families who are struggling with a lingering death. Yes it is important to give permission and say and do all the things that we feel need to be done, for the family as much as the dying person. But we need to divorce ourselves from the outcomes of these interventions. We may be saying or doing those things more for the benefit of the family – or ourselves – then for the dying. We need to be able to say “I don’t know” when asked why the person is still here and note gone. We can help find meaning when people are struggling with the question of “why?”, but also need to be open that we may never know why. It’s here where people of faith may struggle, especially when God’s meaning is elusive or even punitive. Saying that “God has a plan” or “God doesn’t want him yet” may feel comforting to say, but may not feel comforting to those wondering what the heck God is doing. These sentences tend to shut people down rather than open them up. A better plan could be to ask the family, if they are struggling, if they see a purpose in it. If not, recognize that. To some finding meaning is of paramount importance, because “God does all things for a reason.” Encouraging open discussion, telling narratives about other times in life when meaning has been difficult, and being non-judgmental about what meaning they find, can help much more than songs sung to a heavy heart. ← Support our Nicaragua Trip! Lots of good material here. I’ve stood at the bedside of countless dying patients over the years. One only need stand at the bedside while life support is removed from a patient to understands that death is a physical process. Even though warned that a person may not die immediately many loved ones are shocked when life support is removed and a patient lives for hours sometimes days. Oh! And Please, do not call what a priest does Last Rites. The actual Roman Catholic rite for the end of life is The Commendation of the Dying. It can be performed by a priest, deacon, chaplain or layperson. Anointing of the Sick is a sacrament for the sick and those in danger of dying. It can only be celebrated by a Catholic priest. Last Rites is a misnomer. That being said, I appreciate your blog. Thanks for that – a bit of a slip back into chaplain shorthand! Thanks for sharing this terminology (Magical Thinking.) Our CPE supervisor has shared a didactic on ‘Why me?’ I think this Magical Thinking is acutely related to that question. Thank you for your insightful post. There are some areas where I agree with you, and others where I disagree. My CPE supervisor always stated that the question of “why” is irrelevant. Being that, it often makes people feel as if they need to defend their position. In my experience with families who’ve had a loved going through the dying process, or who’ve had a loved one die, and the question of “why” is raised, I have emphatically, and compassionately asked them the question of, “Would it make a difference, or make you feel better if you knew why?” Often when they hear this, and have had a time to reflect the question of “why” is usually, as my CPE supervisor stated, becomes irrelevant to the surrounding situation. Yes, there are times when the question of “why” from a physical/medical standpoint is needed. However, from my experience with families of dying loved ones the question of “why” is raised as a way of finding something to hold onto when one’s personal faith, belief, etc is unable to sustain them at that period of intense grief. For example, I had a family last night whose 4 year old soon to be adopted daughter died suddenly. The foster mother and father both shared with me that their foster child had a multitude of medical problems and was not medically supposed to survive after 6 months of birth; however, God graciously gave this family 3 plus years with this beautiful baby girl. The parents knew that she was gravely ill and could die at any moment. However, the mother kept repeating over, and over, “why”, “why”, “why” when the ER physician shared with them the little girl had died. Yes physical illness can be explained from a medical standpoint, but there are areas such as consciousness and the human spirit that medicine and the physical sciences are clueless about. This is where I believe chaplains, and spiritual support persons are needed because we are able to tap into the realm of the unseen. I personally have had persons who were in a coma (medically induced, and non medically induced) that I visited and provided spiritual support who communicated after waking up that they were able to hear, and that hearing loved one’s talk, pray, sing, read scripture, encourage them etc, caused them to fight harder and hang on, and to not give up. There are many other examples I can provide of patients lose hope, and the will to live and shortly die thereafter, and physicians are unable to explain the patient’s rapid decline. I just want to gently caution you in stating that one’s personal will can be seen as futile in them living and dying. Thanks for your insights! I like your response to the “why” question, but I also wonder if that could close a door in some circumstances. It’s definitely an area that requires nuance and context. In some situations I would never discuss “why”, but in others, say where I know the patient or family better, I’m more open to letting that come out provided they bring it up or have brought it up in the past. I think too we need to remember that the question of “why” isn’t presented to be answered, but only to give voice to their grief as you pointed out very well. I can agree to disagree with you regarding personal will and dying. Yes I believe that there is a spiritual dimension, and I have many anecdotes of times where things seem to happen in just the right way. Even with my own father’s death. But I’ve also held folks in tears as they told me that they were ready and keep wondering why God hasn’t taken them yet. I don’t want it (the role of will) to be seen as futile at all. Rather I don’t want to see it as definitive or ultimate in every case. My apologies if that wasn’t clear. I agree with you that the “will” is not definitive in every case. I enjoy your posts and reflection they have helped me on my professional journey as a chaplain, especially your blogs on verbatims. I look forward to reading more of your blog insights in the future.